Blend all ingredients until smooth. Pour into a Collins glass. Garnish with a slice of pineapple and a maraschino cherry. Usually white rum is used but you can also try aged or dark rum. I tend to prefer a rum with some color to it. If you don't have any pineapple handy, use two ounces of pineapple juice. While a standard Pina Colada is quite refreshing, they do tend to build up on me, especially in hot weather. Here is a variation that dispenses with the cream of coconut and attempts to go for more of a punch profile. Shake all ingredients briefly with ice and strain into a chilled glass. This lighter version goes for fresh and authentic pineapple and coconut flavors. Use fresh pineapple juice if you can. 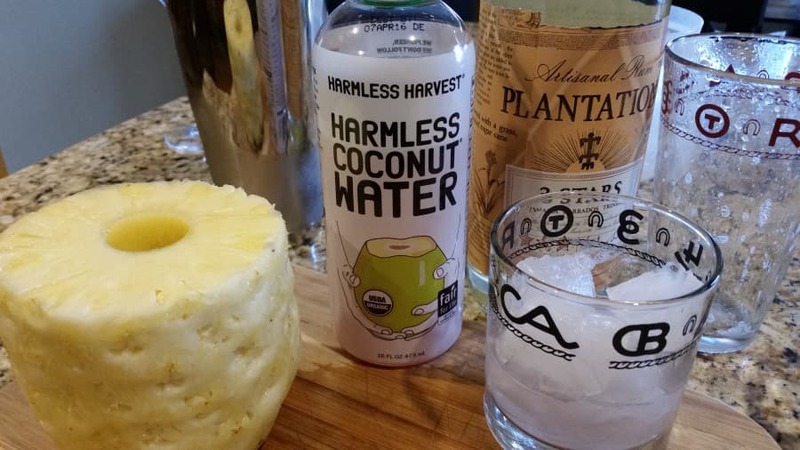 Harmless Harvest is the highest quality coconut water I could find. If you have fresh coconuts then by all means use the water from those. I find a darker more full-bodied rum works well here to bring the other ingredients up a notch. With a white rum the drink seemed rather listless.